All Praises to Allah, The Lord of the entire creations and May Allah’s Peace, Mercy and Blessings be upon Prophet Muhammad, his family, his companions and those who follow their path. We Muslims, these days are exposed to many innovations and cultural misguidances that we take up in our lives and pass to our future generations. We lack in following the Quran and Sunnah as per the way of the Salaf (Pious Predecessors) and in the opposite we strive hard to follow the ways of the disbelievers. One of the celebrations that the Muslims of Malabar (Kerala – India) are indulged in is ONAM. A Muslim who have learnt the basics of correct Islamic Creed (Aqeedah) and about Tawheed will understand what are the aspects of shirk and false beliefs which are mentioned in the above quotation regarding Onam. Do you muslims believe in the many number of gods?, Do you muslims believe in incarnation, Do you believe that Mahabali still lives and visits every year? The strange aspect of the whole festival is that it is taught in our education system that it is the national festival of Kerala and it is celebrated among keralites (Malayalees) irrespective of religion or caste where as in reality the whole festival is based on Hindu myths and religion. Moreover, the hindus have their own rituals on this day. (Abu Dawood, al-Libaas, 3512. Al-Albaani said in Saheeh Abi Dawood, (it is) hasan saheeh. No. 3401). Below are some of the opinions of Scholars who have clearly stated that it is impermissible to celebrate such festivals. "Congratulating the kuffaar on the rituals that belong only to them is haraam by consensus, as is congratulating them on their festivals and fasts by saying ‘A happy festival to you’ or ‘May you enjoy your festival,’ and so on. If the one who says this has been saved from kufr, it is still forbidden. It is like congratulating someone for prostrating to the cross, or even worse than that. It is as great a sin as congratulating someone for drinking wine, or murdering someone, or having illicit sexual relations, and so on. Many of those who have no respect for their religion fall into this error; they do not realize the offensiveness of their actions. Whoever congratulates a person for his disobedience or bid’ah or kufr exposes himself to the wrath and anger of Allaah." Extracted from Majmoo’ Fataawa al-Shaykh Ibn ‘Uthaymeen, 3/44. End quote from Fataawa al-Lajnah al-Daa’imah (2/76). Shaykh al-Islam Ibn Taymiyah (may Allaah have mercy on him) spoke at length in his book Iqtidaa’ al-Siraat al-Mustaqeem li Mukhaalifat Ashaab al-Jaheem (The Requirements of the Straight Path in Differing from the People of Hell), condemning the innovated occasions and festivals that have no basis in the pure Sharee’ah and the ways in which they corrupt people’s religious commitment. Shk Ibn Jibreen Rahimahullah said "It is not permissible to celebrate innovated festivals such as the Christmas of the Christians, or Nowrooz (Persian New Year) or Mahrajaan (Persian festival), or festivals that have been innovated by Muslims such as the Prophet’s birthday in Rabee’ al-Awwal or the Israa’ in Rajab and so on. It is not permissible to eat from that food which the Christians or Mushrikeen prepare on the occasion of their festivals. It is also not permissible to accept their invitations to join them in their celebrations of those festivals, because this encourages them and is tantamount to approving of their bid’ah, which gives the wrong idea to ignorant people and makes them think that there is nothing wrong with that. And Allaah knows best. " From Al-Lu’lu’ al-Makeen min Fataawaa Ibn Jibreen, p. 27. 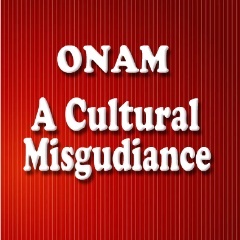 Conclusion: It is not permissible for a Muslim to celebrate Onam or congratulate others on this occasion. It is forbidden to eat Onam Sadhya (feast) or participate in the Onam feast. Instead of congratulating, A muslim must convey the truth to ignorant muslims and non-muslims about Islam, Oneness of Allah, correct Islamic Aqeedah, Tawheed , Day of Judgement, Paradise, Hell and guide them to the true religion. I ask Allah to guide us Muslims to the way of Ahlul Sunnah Wal Jamah and make us follow true Islam upon Qur`an, sunnah and understanding of the Salaf (Pious Predecessors). I also ask Allah to accept this opportunity I have undertaken to make awareness of the ignorant ways among Muslims of Kerala. Please pass on the article on all the mediums you can in order to educate the Muslim from the evil practises.